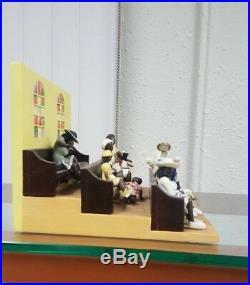 " Coming Together " One figurine that brought together Gimme Dat Gum, Holy Ghost and Mother Board Limited edition of. Add this piece to your collection today. To all United States addresses within the 50 states of the USA. Although we are often imitated we are never duplicated. Our high-level of integrity and our desire to please our customers can not be matched by imitators. Annie Lee began painting at the ripe old age of ten, winning her first competition during that very year. Her accomplishments continued throughout her teens culminating in an offer of a four-year scholarship at Northwestern University. Though she declined that scholarship, Annie Lee did return to the study of art at Mundelein college. This was after producing two wonderful children, enduring the grief of being widowed twice and having celebrated 40 birthdays. Lee also studied at the American Academy of Art and earned. Her Masters of Education degree from Loyola University. Lee's art reflects he remarkable ability to observe and draw life as she sees it, combining the elements of humor, satire and realism to relay those observations to us. As a result her work has been internationally acclaimed and warmly received by not only the African-American culture, but also by art lovers everywhere. Her works have been shown in hit TV shows such as "ER" and "A Different World" and in Eddie Murphy's movies "Coming to America" and Boomerang. In 1997, Annie Lee signed Sandy USA, Inc. To be the exclusive licensee of Sass'n class by Annie Lee. This collection of resin figurines re-created from her canvas paintings has been an outstanding success. Each figurine has captured the essence of the artwork, equally full of humor. Her trademarks are the animated emotion of the personalities in the artwork and the faces which are painted without features! This allows collectors to Feel the scene and interject their own personalities into the work. The unique collection is of the highest quality workmanship, and with optimism, joy, and tenderness, depicts life and events which are all part of the human experience. We do not mark merchandise values below value or mark items as gifts- US and International government regulations prohibit such behavior. In the event that items are broken, customers must contact Beauty's International Marketplace within 24. Customers address is incorrect due to the customers negligence. Also note, the following are not refundable. 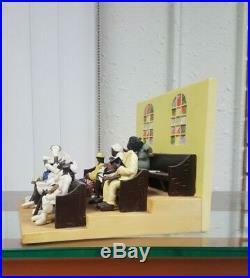 The item "Annie Lee Figurine Coming Together/African American Art/Holy Ghost" is in sale since Saturday, December 15, 2018. 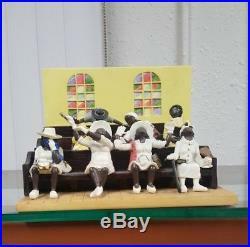 This item is in the category "Collectibles\Cultures & Ethnicities\Black Americana\Other Black Americana". The seller is "beautysinternationalmarketplace" and is located in Southfield, Michigan. This item can be shipped worldwide.